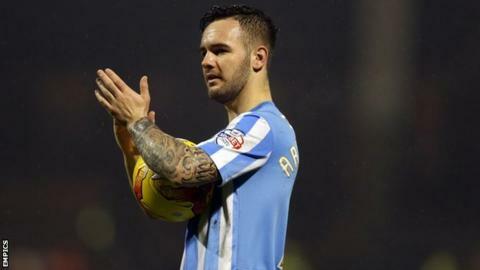 Coventry City manager Tony Mowbray says a deal to keep in-form striker Adam Armstrong on loan until the end of the season still needs "rubber stamping". Armstrong, 18, has scored 16 goals in 22 games for Coventry since arriving from Newcastle last summer on a deal that due to expire on 16 January. "We have to be cautious," Mowbray told BBC Coventry and Warwickshire. "Until there's a new deal signed, we're just happy we've got him for the period we have - hopefully he'll stay." Armstrong bagged his first professional hat-trick in Saturday's 5-0 win at Crewe Alexandra, which keeps fourth-placed Coventry in touch with League One's top two. Despite Magpies head coach Steve McClaren indicating that he is happy to see the striker stay at the Ricoh Arena, Mowbray is not taking anything for granted. "The deal's yet to be rubber stamped as far as I'm concerned," Mowbray said. "I saw Steve's comments but until everything's done, it's never done." Meanwhile, the Coventry boss said he is also hoping to secure an extension to the loan of Armstrong's Newcastle club-mate Gael Bigirimana with a view to a permanent move.